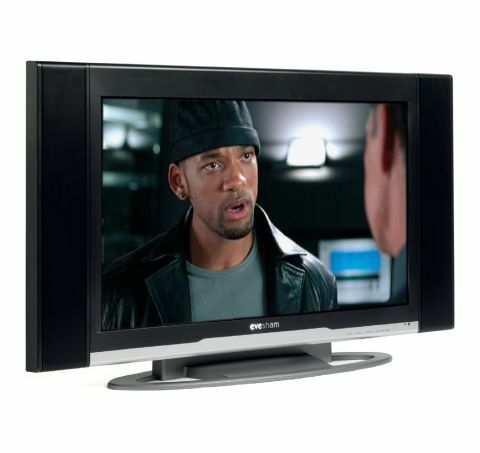 LCD TV is providing a perfect avenue for traditionally PC brands to have a crack at the AV world. Performance from these PC crossovers have been mixed at best, but they're certainly competitive on price, and Evesham's £700 V32EMRO is no exception. Connectivity is as you'd expect for the price, comprising a single HDMI, two Scarts, a PC input, a component video input, as well as S-video and composite video fallbacks. Features are thin on the ground. Like the Hitachi 32LD6600, there's no digital tuner. The only features of interest are a picture-in-picture system, a backlight adjustment, a BBE audio enhancement and unexpected compatibility with 1080p signals as well as the usual 720p/1080i HD fodder. Our test disc of I, Robot quickly reveals that colours slip all too easily into looking over-ripe and unnatural. Skin tones look alternately too green or too red. Colour saturations are in general rather muted too. Black levels don't impress either, as you're forced to watch dark scenes through a layer of greyness. Even what black level there is seems forced, with dark image areas resembling empty holes. The V32EMRO also has smearing problems with motion, especially where there's any sort of noise in a source. This luckily doesn't apply to our HD I, Robot movie, but standard definition, and even a few less accomplished HD broadcasts, certainly suffer more than we'd expect from a TV boasting an 8ms response time. It's probably at least partly because of these motion problems that the V32EMRO doesn't make high definition look as sharp as we'd like. On the upside, aside from the motion smearing, none of the problems we've reported are really that awful. The V32EMRO has a generally decent suppression of noise and high brightness level. This means that, overall, its pictures are at least watchable, if hardly state of the art. Those big speakers (which account for this LCD TV's bigger than average frame) certainly achieve deeper bass levels than is customary for a flat TV, producing impressive amounts of treble detail. But during louder moments, the bass becomes slightly swallowed, and trebles harshen. Even so, it's not the underpowered horror you might expect for £700. In the end, we reckon that the V32EMRO's price just about saves the day and makes it worth a passing thought. But a budget classic it certainly is not, and its high definition pictures aren't up to the standards that we've come to expect.